Schuylkill County is strategically located along the Interstate 81 corridor and Interstates 78 & 80 are also in very close proximity. It encompasses 782 square miles. Due to its geographic location, Schuylkill County is easily accessible to major metro areas and markets along the eastern seaboard. Major arterial routes include PA Route 61 and US Route 309. 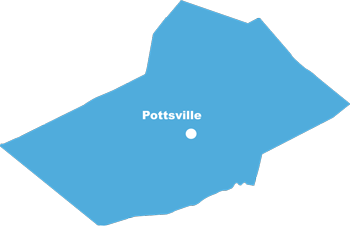 Schuylkill County is located within the Pottsville Micropolitan Statistical Area. The City of Pottsville is the major commercial center in Schuylkill County with a vibrant downtown district . Airline service is available at the Schuylkill County Airport near Pottsville. It is capable of providing small jet, medium passenger and cargo transport aircraft. Freight rail service is also available from Reading Blue Mountain and Northern Railroad. Schuylkill County enjoys a diversified economy. 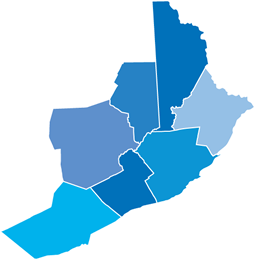 Schuylkill County’s economy is dominated by the manufacturing, transportation and warehousing and service related sectors. Small businesses contribute significantly to the economy of Schuylkill County as there are numerous companies with less than 25 employees. The Pottsville Schuylkill Technology Incubator serves as major entrepreneurial resource. Agriculture and agricultural processors also have a significant presence in Schuylkill County. In recent years, the Schuylkill Highridge Business Park with its 36 mile frontage on I-81, has been an economic driver in Schuylkill County as many easily recognizable businesses such as Lowes, Wegmans, WalMart and many others have made investments in this Park. In addition, there are developed industrial/business parks throughout Schuylkill County. Post secondary education is available from several colleges in Schuylkill County including Penn State (Schuylkill Haven Campus) and Alvernia College (Schuylkill County Campus).